Running from Dec. 6 through March 24, two exhibits at the Bates College Museum of Art approach architecture from very different angles.The Upper Gallery exhibit is titled 2001 Biennial Design Awards of the Maine Chapter of the American Institute of Architects. It will consist of building designs, by firms throughout Maine, that were judged for excellence in architecture. AIA Maine’s Design Awards program recognizes architects who strive for excellence and drive the evolution of Maine’s built environment. For the first time, AIA Maine invited another New England chapter of the institute, AIA Vermont, to jury the awards, and will in turn jury that chapter’s awards. For more information about the exhibit, call Judith Harvie of the AIA at 207-623-1218. 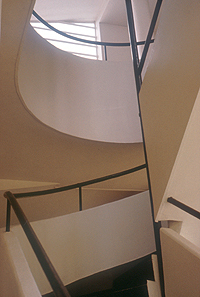 The museum’s Lower Gallery houses an exhibit titled Elizabeth Donoff: Two Photographic Promenades: The Villa La Roche-Jeanneret and the Villa Savoye. Through her 1993 images of two influential buildings by the pioneering modernist architect Le Corbusier, Donoff examines how photographs control our perception of architecture. Donoff graduated from Bates in 1989 and holds a master’s degree in architecture from Washington University, in St. Louis. There is no opening reception for the AIA Maine exhibit. Donoff will give a lecture about her work at 7 p.m. Friday, Jan. 11, followed by a reception. The Bates College Museum of Art is located in the Olin Arts Center at Bates, on Russell Street in Lewiston. It was founded to preserve the nation’s largest repository of Marsden Hartley drawings and other items relating to this important American artist, a Lewiston native. Its other holdings include a robust print collection and notable works by Maine artists with national significance, such as Dahlov Ipcar, the late William Thon, Neil Welliver and Charles Hewitt. Admission is free. The museum is open 10 a.m.-5 p.m. Mon.-Sat. and 1 p.m.-5 p.m. Sun. The museum is closed Christmas Eve, Christmas, New Year’s Eve and New Year’s Day. For additional information, please call 207-786-6158.